While I was busy giving away my Anna Griffin stash, I neglected to share some of the fun fall projects I was working on for the We R Memory Keepers blog. Here's a little round up of some of those projects. There are so many thing I love about the fall–pumpkin patches, corn mazes, cool weather, fall leaves, hot cocoa, and of course fall crafting! Since fall is so wonderful I thought it would be fun some fall project ideas. I’ll start things off with a bitty piece of fall decor perfect for your mantle or other decorative shelf in your home. 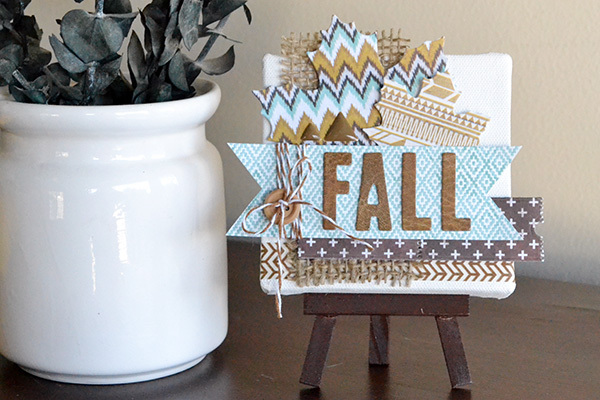 I created this project with the Indian Summer collection--I love the colors and patterns! For full supplies and instructions for this project, visit the We R blog HERE. The leaves in the nearby mountains are already turning fall colors, and pretty soon they’ll start turning down here–that is one of my favorite times of the year. I love the beautiful fall leaves and colors (not so much the raking part) and was so glad I captured that in this photo that I scrapbooked recently. My most favorite part about this photo is that my daughter and her aunt are playing baseball together and enjoying the fall weather, but my next favorite part is that the yard is covered in yummy fall yellow leaves! 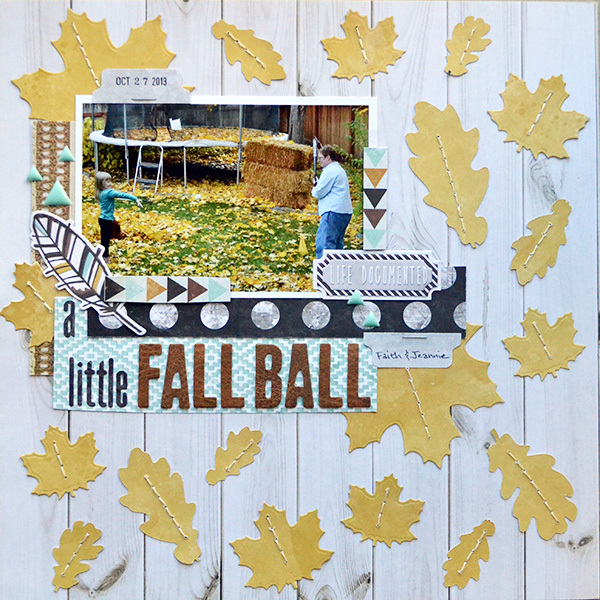 I decided that I wanted to replicate the carpet of leaves in the photo on my page background, so I die cut several leaves using the Maple Leaves Nesting Dies, Leaves Punch Dies, and my electronic die cutting machine to create a lovely fall backdrop. I scattered them around my white-washed fence background paper, mixing the sizes and styles of leaves. For full supplies and instructions for this layout, visit the We R blog HERE. When I think of fall, images of beautifully colored leaves are what first come to mind. But another fun fall icon that I love is owls. They’re darling on fall projects of all kinds. 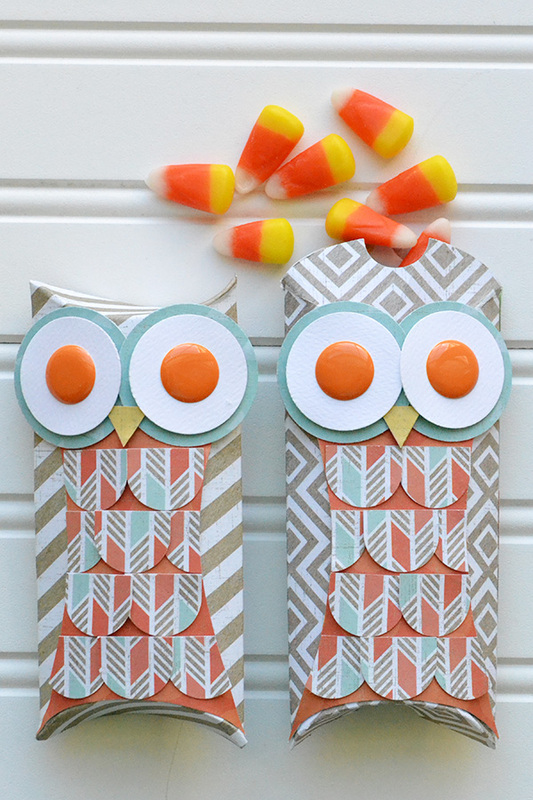 I was inspired by this festive critter to create some owl pillow boxes for fall. Take a peek! 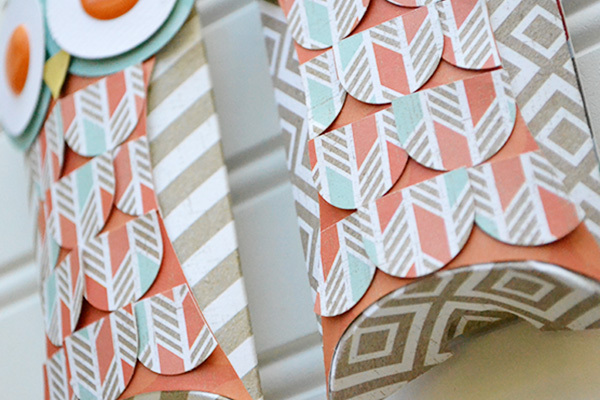 I used my Pillow Box Punch board to create the box, and to create some feathers for the owl’s belly I punched out several notch shapes with my Thumb Notch Punch and layered them over the orange belly. For full instructions and supplies for this fun project, visit the We R blog HERE. I hope you've enjoyed some fall crafting inspiration. I'll share some more fall projects in a round up next week. Creative cheers!